If your business or organisation needs to start rubbish and recycling collections using bags which are presented for collection on the street then please have a read of this page. Our 5 Step Guide to starting bagged waste and recycling collections will take you through a few important considerations that need to be made when using bags for your rubbish. This will ensure that you are managing your waste in the most environmentally friendly way possible, without causing a nuisance to other people in your street. This could be anything from putting your rubbish in the correct bag, to ensuring your rubbish bags are put onto the pavement at the right time for collection. Let’s have a look at what our interactive guide covers. Firstly you need to decide what waste needs to be disposed of. Will this be general rubbish, recyclable material or both? Its preferred if you use our plastic or metal waste bins for your rubbish and recycling. 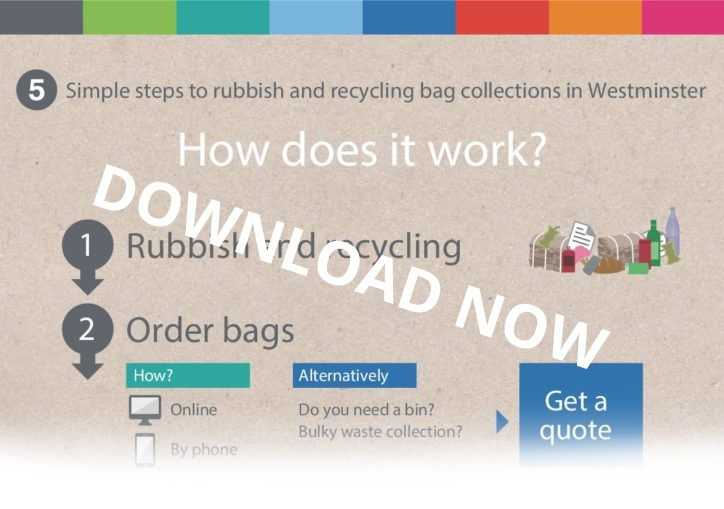 You now need to decide how you want to order any waste and recycling bags. You can do this through our online portal, or over the phone. If you require a waste bin or a bulky waste collection then you can get a quote for these services. Next, we have one of the most important steps to follow. Ensuring your waste is in the correct bag. Always remember your general waste goes into red bags, your mixed recycling goes into blue bags and cardboard needs a yellow cardboard sticker. Now your waste is in the correct bags it’s time for them to be collected. Our infographic will provide you with a link to collection times on your street. It will also give you tips on the best practice for putting your bags out for collection. Finally, your bags are collected by one of our collection crews. If you want to know when you can place your waste and recycling bags out for collection on the street and how to do this correctly then please read here. Our interactive PDF guide can give you a visual representation of everything we just discussed. Just download and click on the relevant icon to follow some handy links along the way. To download a copy of the guide click on the image below.